You are making your community safer and more active with your suppo the Pedestrian Bridge on the South Huron Trail Project. With your help, we have built Jones Bridge and you have helped to turn this dream into a reality. Donations are still needed to complete the project including the above ancillary structures as well as a legacy preservation fund for Jones Bridge. Donations to the Jones Bridge project, made directly to Ausable Bayfield Conservation Foundation, are eligible for charitable gift receipts for income tax purposes. To learn more, or to donate, visit https://www.abca.ca or phone 519-235-2610 or toll-free 1-888-286-2610. You are also invited to contact any of the members of the community working group. Their names are in the bridge brochure available online and in printed copies. Jones Bridge is a new pedestrian bridge linking both sections of the South Huron Trail and providing a safer, more scenic alternative to walking beside vehicle traffic along Morrison Line. Jones Bridge is open and ready for use. The bridge is located downstream of Morrison Dam on the MacNaughton–Morrison Section of the South Huron Trail. The bridge was installed in November of 2018 and is ready to use. The structure allows trail users to safely cross the Ausable River without having to walk along Morrison Line. Fundraising continues with donations coming in each week. But we still have a ways to go to complete the needed fundraising and to construct ancillary structures in support of the Jones Bridge Project. To donate, please complete the donor form from the pedestrian bridge brochure and mail it to Ausable Bayfield Conservation Authority at 71108 Morrison Line, RR 3 Exeter, ON N0M 1S5 or visit the ABCA office or call with credit card information. The official opening and donor recognition event is scheduled for Saturday, April 27, 2019. The bridge is suitable for pedestrians, cyclists, strollers, wheelchairs, the South Huron Trail Mobile (for people with limited mobility), and winter visitors. The completion of this project could enhance use of the trail for decades. Iron Bridge Fabrication Inc. of Brunner, Ontario manufactured the bridge structure. VanDriel Excavating Inc., of the Clinton area, did the work needed to erect the bridge including pouring abutments and installation of the bridge. B. M. Ross and Associates Limited, of Goderich, is the project’s consulting engineer. There is additional work and ancillary structures completed in the new year (2019). Some trail users had to walk beside vehicle traffic beside the roadway over Morrison Dam in order to enjoy both sections of the South Huron Trail. The new pedestrian bridge changes that by offering a safer, more scenic alternative. The bridge is suitable for pedestrians, cyclists, strollers, wheelchairs, the South Huron Trail Mobile (for people with limited mobility), and winter visitors. 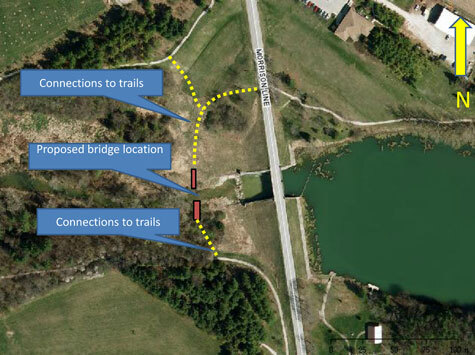 Project organizers say the public has been incredibly generous in support for the project to build a bridge to a safer, more active community with the creation of Jones Bridge, a new Pedestrian Bridge on the South Huron Trail. The total capital cost of the Jones Bridge Project is more than $300,000 and donations and pledges have helped the Pedestrian Bridge Community Working Group get closer each day to reaching the fundraising goal. In the event of heavy rain, please go to the Woodland Reflection Shelter. The community fundraising campaign is now close to its capital project target. Donations are still needed to complete the project including ancillary structures and to maintain the bridge and associated structures through a legacy bridge preservation fund. Donations to the Jones Bridge project, made directly to Ausable Bayfield Conservation Foundation, are eligible for charitable gift receipts for income tax purposes. To learn more, or to donate, visit www.abca.ca or phone 519-235-2610 or toll-free 1-888-286-2610. You are also invited to contact any of the members of the community working group. Their names are in the bridge brochure available online and in printed copies. Visit our News and Events for more news about Jones Bridge.